When we think of the Wild West we often think of the old films with John Wayne or Clint Eastwood. They’d sit out under the stars, eating beans from a can and chewing tobacco. I grew up watching those films and I still can’t picture a cowboy without thinking of him walking cross the badlands spitting tobacco onto the sand. But of course the Wild West of the films wasn’t quite the same as the real Wild West. The real Wild West was a very different place indeed. One of harsh conditions, lack of food and battles over land, like the Indian Wars. The frontiers people who came to the western states looking for a new life, had to be hardy folk, who had the skills to take care of themselves with little resources and scarce food availability. Many of the early arrivals came on foot, with pack horses or driving heavy-laden cows. Some even trundled their few household goods in wheelbarrows along the forest traits. Roads, over which oxen could draw covered wagons, had yet to be cleared. In this article, we’ll look at how the frontiers folk coped with food scarcity. How they used skills like hunting, like growing and gathering vegetables and the techniques they used to preserve food during often very hard winters. Local food was either hunted or found. Buffalo and squirrel were two of the meats that were part of the staple diet, certainly of the early settlers. In the early days of the Wild West, buffalo roamed widely and freely across the plains. There was an estimated 40 million in North America in 1830; by 1889 there were 541. The reason for the sharp decline in numbers wasn’t due to cowboys feasting on buffalo meat. No, that was down to commercial hunting. Still, buffalo was part of the diet of the early settlers because of its abundance. Buffalo hunting took two forms, ‘running’ and ‘approaching’. Running, involved great horsemanship and marksmanship. The rider would chase up against the animal on horseback and raise his gun to shot the beast as it ran alongside. Good huntsmen were known to kill 5 or 6 animals in one hunt. It was a dangerous practice, if the animal was only wounded it could potentially turn on the rider and horse. Approaching involved the type of hunting our earliest forebears would have practiced, which is stalking and using understanding and knowledge of the beast’s behavior. The hunter would use his skill and guile, using his Winchester to kill his prey. Buffalo being big beast, would provide a lot of meat for many people. The problem was the storage of the meat, we’ll explore the methods used, later on. Other meats came straight from the forest. This included, squirrel, pigeon, rabbits, wild ducks, deer and in the far west, antelopes and elk. The latter were more difficult to hunt, as they were extremely fast and very alert. In the early days of the Wild West, meat was abundant, but as more settlers arrived it became less so. However, this was offset by the increase in the farming of domestic animals like pigs. Vegetable gardening was one of the priorities of the early settlers of the Old West. Planting of a variety of vegetables, including, squash, beans, peas, sweet potatoes and potatoes, as well as onions cucumbers and melons, was part of the pioneer skill set. The Old West ‘kitchen garden’ was usually planted twice a year, much like modern vegetable patches. The spring garden would provide produce such as peas and early cabbages, whereas the late summer garden would provide food through to the early winter. This planning out of the patch was important to provide year round supplies and help avoid spoilage. There were also plenty of wild vegetables available, such as wild onions, dandelions and dock as well as a variety of salad type leaves such as plantain. Fruits like chokeberries and huckleberries were available in places like Montana. Corn, a staple of early West settlement, was important as a vegetable, but also for bread and biscuit making. Corn was grown from south North Dakota though to Kansas, Nebraska, south Colorado, New Mexico and Arizona and many other places. Organized planting of kitchen gardens was one way of ensuring year round produce, but there was a real requirement to find ways of keeping food for long lengths of time, especially over winter. Frontiers people used a variety of techniques to preserve food. Scurvy was a problem over wintertime when fresh vegetables were very scarce. Catharine Beecher was the ‘go to’ authority on methods of preserving vegetables and her book “Miss Beecher’s Domestic Receipt Book” published in 1846 offered advise and recipes for pickling vegetables (see below for an example). Fruit and vegetables could be kept for extended periods by drying them out. This had to be done on a sunny day. The fruit would be prepared, often being cut into slices, then set under some light cloth (cheesecloth for example) and left out in a sunny spot. It was important not to let the fruit get too hot as this would cook it; but instead to dry it over a few days. As soon as the animal was killed, the preparation for preserving the meat had to be made. Any meat not eaten immediately would go off quickly, especially in the summer months. 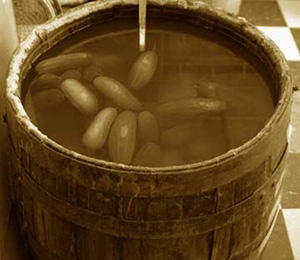 The main method of preservation in the early day of the Wild West was to salt the meat. Again Catharine Beecher gave the settlers advise on how to do this (see her recipe below). 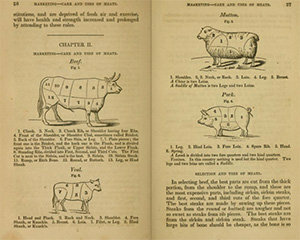 Drying meat was a recommended method for preserving beef and buffalo. Drying involved salting slices of meat, then laying the meat slices out for 2 weeks before then placing in brine for a further 3 weeks. After which the slices were dried with a cloth and hung in a cool dry place away from flies. This was probably the most complicated of all of the preservation techniques and involved specially prepared smoke houses. Typically, the meat would be salt cured first, sometimes using a mix of herbs for flavor. Then the meat would be hung in smoke houses over a hickory or oak based fire. The meat would hang in these smoke houses for up to a month. Note a modern marinade would include soy sauce and molasses. Make up the brine solution, mixing all of the ingredients together. Add the thinly sliced meat and mix through the brine solution until completely covered. Place a plate, or similar, on top of the meat and press it down firmly onto the meat. Leave in a cold place (ideally a refrigerator or similar) for around 8 hours. Next rinse the brine off the meat with water and dry the meat slices with a cloth. Air-dry the meat for an hour. You can now add other flavorings, such as herbs or pepper. 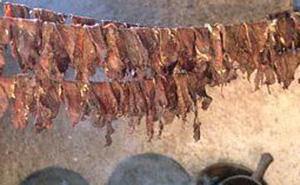 Air-drying over several days in a hot climate was the original way jerky was made. However, safer ways include drying in a low heat oven. The oven has to be very low heat and it takes many hours for the jerky to dry out (it’s important not to let it ‘cook’). If you have a smoke house, use that, it makes great jerky. 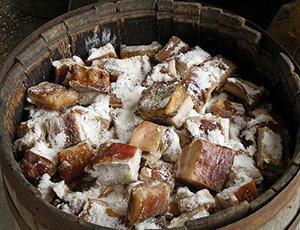 “Directions for salting down Pork. Cut 2 potatoes up into about 8 pieces and boil until tender. Take about 2 cups of the potato water. Mix into the water, 2 cups of flour and 1 tablespoon of sugar. Put the mix to one side and wait until it doubles in size. 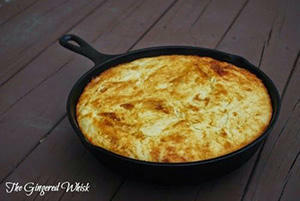 Mix the starter, cornmeal, milk, sugar and beaten eggs together until well mixed. Add the fat, salt and soda. Pour the mix into a greased tin and bake for 30 minutes at about 400F. Written by: C.Davis on March 3, 2016. Last revised by: James Cole, our reviewer, on May 13, 2018. The early government wanted the settlers to kill most or all of the Buffalo to keep the Indians from the protein that the meat provided so that they would give up their land to the US government. We where ruthless to the Indians that helped the Europeans survive. Women also sewed and mended clothing for the family. Keeping clothes clean was a hard job before automatic washing machines. Monday was wash day. Children often hauled buckets of water to the stove where it was heated. Then each piece was scrubbed on a wash board, rinsed in boiling water, wrung out and hung up to dry on the clothesline. On Tuesday the clean clothes were brought in and the shirts and dresses were pressed with heavy irons heated on the stove. BUT you can’t generalize about the Indians “who helped the Europeans to survive.” Look at the Mohawks and other tribes of the Iroquois Nation in northern NYS and Quebec, and the way they tortured the French missionary priests who sincerely tried to HELP THEM (like when there were flu epidemics and the Indians were dying in droves thanks to their medicine-men’s “treatment”). If you read just a little of what they did to St. Isaac Jogues and the other men who today are known as the “North American Martyrs” (but don’t read while you’re eating, it’ll make you ill), it’s hard to conclude that these Indians were anything but diabolical. Sick, twisted, sadistic, and evil. Bottom line: there was plenty of fault to go around. I know the receipts that you quoted did not use worstershire but it was around…it was discovered in 1824 and developed and marketed in 1828 so do not discount a receipt if it is mentioned.